I have recently developed a love affair for circle skirts. The popular trend that was first worn in the early 1950s in making a comeback this season in a big way. You can find circle skirts in nearly every store, and in literally every color, pattern, texture, and length, imaginable. They are so versatile, and can be paired with any style top, or shoe. They can be worn with a casual outfit, or with a more sophisticated, and dressy outfit. Not to mention, that they are incredibly flattering, and look great on almost any body type. Circle skirts are by far the biggest skirt trend for this spring and summer, and rightfully so. They are beautifully structured, and look great on practically everyone. So if you don't already own a circle skirt, or two, or five, I definitely recommend investing in them. They are guaranteed to quickly become a staple piece in your wardrobe, and will without a doubt get their moneys worth of wear. (and even more) They can be worn to a casual lunch with friends, to a romantic dinner date for two, to the mall for a fun filled day of shopping, or even to the beach on a hot summer day. So why not hop on the circle skirt bandwagon, and go a little crazy. Develop your own love affair for them. Trust me, this is one trend you won't regret obsessing over. Great post! I love these skirts too!! I´m following you. Will you follow me? 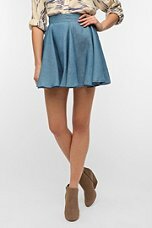 I am also looking for Cheap Skirts For Women that are appropriate for work and then I can just wear them to evening events as well. The FC (1st one) is my favorite! It is a must that the girls clothes be kept in a clean place, ready for washing. Thanks for this.